Oil and water don’t mix. But our aqueous blood is full of different types of hydrophobic lipids — including cholesterol. In order to travel via the bloodstream, those lipids need to hitch a ride on an amphipathic carrier. 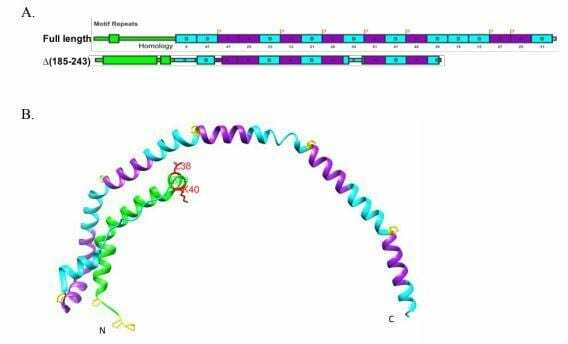 In a recent paper in the Journal of Lipid Research, scientists at Boston University report an advance in our mechanistic understanding of how one such carrier forms. “Lipoproteins are like boats that deliver and remove cargoes of fatty substances to and from our cells,” said David Atkinson, chair of the physiology and biophysics department at Boston University School of Medicine and the senior author on the JLR paper. The subset of those “boats” that carry cholesterol and other lipids to the liver from other parts of the body are called high-density lipoproteins (HDL, aka “good cholesterol”). HDL can remove cholesterol from distal cells — such as macrophages in the walls of arteries, where cholesterol accumulation can lead to heart attacks — and deliver it to liver cells, a process known as reverse cholesterol transport. The liver disposes of excess cholesterol by converting it into bile acids secreted into the small intestine. HDL particles are built on a scaffold protein called apolipoprotein A-I (apoA-I). ApoA-I is thought to collect cholesterol and phospholipids from the cell membrane. Atkinson and his team wanted to understand better how that process works. ApoA-I depends on a lipid transporter protein, called ABCA1, which pumps cholesterol from the inner to the outer leaflet of the cell membrane. Because the cholesterol that ABCA1 transfers usually ends up bound to apoA-I, some researchers suspected there was a physical interaction between apoA-I and ABCA1. Meanwhile, others argued that cholesterol and phospholipids could just as well diffuse passively iand bind to apoA-I. And the available experiments, most of which were based on crosslinking, didn’t settle the debate. The team, led by graduate student Minjing Liu, and supported by Dr. Xiaohu Mei and Dr. Haya Herscovitz, used isolated apoA-I and ABCA1 to test for a physical interaction. They were able to show immunoprecipitation of apoA-I with purified ABCA1. The lab had earlier designed a mutantapoA-I with a little extra wiggle in an already-flexible hinge region. For this study, they used the mutant to show that higher flexibility increased apoA-I lipidation, or the formation of nascent HDL. The team has not yet tested whether the extra-flexible mutant binds to ABCA1 better or whether binding of either form of apoA-I activates ABCA1. But about one thing, Atkinson is certain. “It’s the ApoA-I/ABCA1 interaction which then enables the nascent HDL particle formation to happen as the membrane components are being transported out by ABCA1,” Atkinson said. Increasing reverse cholesterol transport may someday be a way to reduce atherosclerosis and heart disease. Atkinson is optimistic about the promise of understanding the physiological processes better. “Translational research might be in vogue, but remember that if you don’t do foundational basic discovery research, you will not have anything to translate,” he said. How does the sun's rotational cycle influence lightning activity on earth?